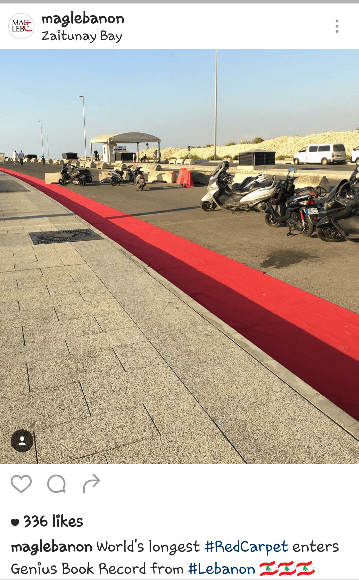 The BIAF red carpet which has been trending for the past day (for all the wrong reasons, obviously) seems to have really broken the Guinness World Record for longest red carpet. My concern is the genius social media employee behind Mag Lebanon‘s epic typo, spelling “Genius” instead of Guinness. I mean, how could they get it wrong? The only explanation is that this person maybe never really saw how the word is actually written! Not only does Mag Lebanon have almost 50,000 followers on Instagram, the photo has been reposted by several other accounts, one of them being StyleInBeirut which has over 380,000 followers! This Guinness record breaking is already ridiculous enough, some people (calling themselves “influencers”) should at least get the name correct!